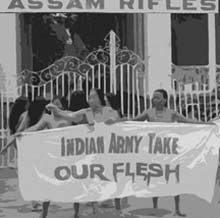 ‘Indian Army Take Our Flesh’, Demonstration at the Kangla Fort, Imphal, Manipur, 15th July 2004. Cover design by Bibhas Das. 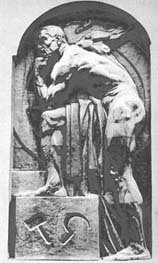 Worker, Matvei Manizer, 1920, Bronze. 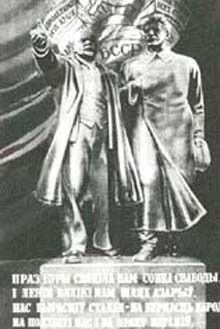 ‘Through storms a son of freedom shone and great Lenin illuminated our way. Stalin brought us up for loyalty to nation for hard and enthusiastic labour’, circa 1950. India: 2004 Elections and After, N.M.
Obituary: Farouk Abdel-Muhti 1947-2004, G.G. Review: ‘The Life and Times of Joseph Stalin’, M.R. Appan, G.G.